The Boeing Model 737 is considered one of the most successful airliners ever built. Boeing has built nearly 9000 of these aircraft since its introduction in 1968 with thousands of more orders on the books. 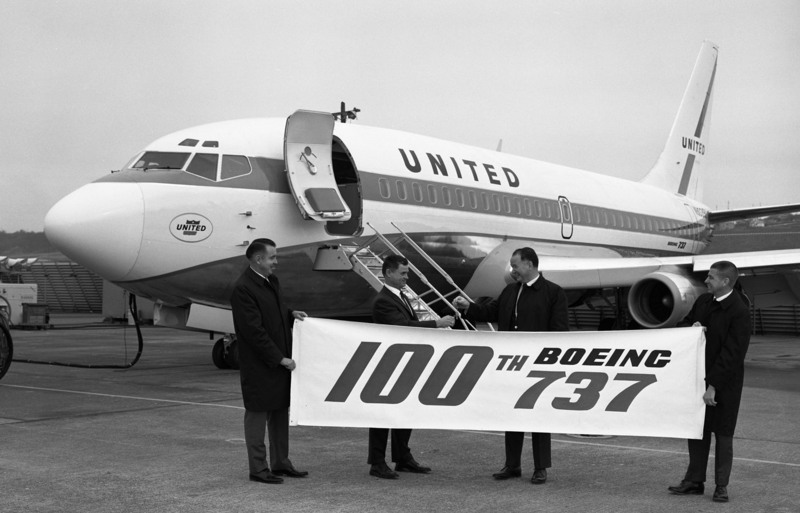 Just this month the 737 celebrated the 49th anniversary of her first flight. Currently Boeing's only narrow body aircraft in production, the 737 has been produced in seven variants over the years, the -100 through -700. The next iteration, the Max-8, is currently undergoing flight testing and is scheduled for delivery to launch customer Southwest Airlines next year. I flew the 737-200 in both the left and right seat from the time I was hired until my airline retired the aircraft from the fleet in the early 2000s. I have many thousands of hours of time in this aircraft and really enjoyed flying her. The 200 was a pilot's airplane meaning that she was responsive and easy to fly. It was easy to put the airplane where you wanted her and once you learned the tricks to make a smooth landing such as the "roll-on", she was a real cream puff. The 200 had her drawbacks as well. Being underpowered was one of the greatest frustrations. When Boeing introduced this aircraft as the -100 model, it came equipped with Pratt and Whitney JT8D-7 engines producing about 14,000 lbs of thrust. This aircraft was so underpowered that it was not even allowed to use full flaps to land as there was too much drag. The 100 model was quickly replaced by the -200 model which offered the upgraded JT8D-9 engines producing 15,500 lbs of thrust. I only flew the aircraft with the -9 engines. Still, she was kind of a pig. Don't Shut Off the APU! Taking off of short runways was always kind of exciting. One procedure with which all -200 pilots had to become intimately familiar was the "bleeds off" takeoff. During normal operations, hot, compressed or "bleed" air is drawn out of the engine to run the air conditioning and to provide pressurization. When taking off from a short runway on a hot day, drawing that bleed air means that it isn't available to produce thrust. So one method to increase thrust from the engines was to turn the bleeds off and to use air from the auxiliary power unit (APU) for air conditioning until getting airborne. Without the extra thrust from the bleed air being available, there often wasn't enough thrust for a safe takeoff. It was during taxi-out and after takeoff that problems arose. There are six switches controlling the bleed air plumbing on a 737 and they must be positioned correctly. One particular mistake could cause damage if both the engine and APU bleed valves were open at the same time as the engine would overpower the APU. Otherwise, one of the more common mistakes was to forget that the APU was needed and to accidentally shut it off. This usually happened right after being cleared for takeoff meaning an embarrassing call to the tower that you had to delay to start it up again. Once airborne, forgetting to reconfigure the bleeds back to normal could be a big problem. If you climbed high enough like this, you might get the altitude warning horn as the cabin wouldn't pressurize. Go higher still and you'd get the "rubber jungle" as the masks fell. Besides causing a severe panic in the back, it was a guaranteed trip to see the chief pilot followed by an unpaid vacation as you'd probably get some time off. Other aspects of the low thrust of the aircraft meant that turning on the engine anti-ice would slow your climb rate and turning on the wing anti-ice meant almost no climb capability as it used quite a bit of bleed air. That said, the cooling capability was always great on the 200. It wasn't until the introduction of the -300 that Boeing changed the air conditioning to include a "low flow" setting which made that airplane hot in the summer. I loved flying the 200 as it was very responsive to control inputs and easy to trim. Later models for whatever reason never had the tight feel of the flight controls that the -200 did. Think of going from a Triumph to your dad's Buick. She was quite easy to land consistently well once you learned how to do the "roll-on". The roll-on was accomplished by executing a slightly aggressive flare just before touching down at about 5 feet altitude and then releasing back pressure on the yoke just as the aircraft touches down. Done correctly, there would be nearly no perceivable thump at touchdown, just the appearance of runway rumble. It was quite impressive. The "science" behind the roll-on was that the landing gear are aft of the center of lift. What this means is that the release of back pressure on the yoke actually caused the landing gear to touch down at less vertical velocity than the aircraft overall as the plane was now rotating forward around the center of lift. The only problem with this technique was that if you screwed it up, you really knew it. Time it wrong and the gear will hit the runway at a vertical speed greater than the aircraft as a whole resulting in a really hard touchdown. Back in those days you might get a flight attendant to come up who had refastened her bra around her waist to drive home the critique of a hard landing. As I mentioned, the -200 was a pleasure to fly. The caveat was that this was only on nice or "visual flight rules" (VFR) days. She was not much fun in the weather for many different reasons. As I mentioned above, using the anti-ice tended to kill climb performance, but there were other problems. The radar was close to useless in many cases due to its inadequate stabilization. The weather radar on an airliner is designed to allow pilots to avoid thunderstorms. It does this by bouncing radio waves off of relatively thick storm clouds. The radar antenna has to be stabilized in relation to the horizon because when the aircraft is in a bank, the radar would only see ground returns. For whatever reason, the stab on those radar just didn't work right which meant a screen filled with red ground returns whenever the airplane was turning. Thankfully that problem was fixed in later models. Another annoying issue was that only the captain's instruments could be tied into the autopilot in order to fly a "coupled" approach on our models. That meant that first officers had to ask the captain to set up their radios when the first officer was flying an approach. It seems crazy, but some captains would be put out by such a request. That problem went away after I upgraded to the left seat. After that, I always got to fly with my favorite jerk. One fun feature of the autopilot is that when it was turned off, it would make a small click whenever the controls were moved out of the neutral position. Pilots of course would then use this "scoring" system to bet for beers by who could fly an approach generating the fewest clicks. This next part may have more to do with flying during the era before 9/11 but I associate it with flying the -200. Flight attendants would routinely come up front to chat before armored doors and protocols made it so onerous. We might be flying a 40 minute leg completely full, but the flight attendants would still manage to come up to give us our beverages if not to chat for a minute. It's a rare occurrence today. I'll fly a five hour flight and never see or hear from them. Ah well, at least I got to experience some of the more relaxed times. One of the favorite tricks was to float a lightbulb on the gasper vent and to then call the girls up front. We had a store of small lightbulbs to be used to replace burnt out bulbs in the cockpit, and also an air vent called the eyeball gasper much like the overhead vents in back only this one pointed up. Well, the airstream would float the bulb in midair as a hairdryer will float a ping pong ball. We'd then explain that it was voice activated. I'd give the command to stop as my F/O would discretely turn off the switch and the bulb would drop. When offered to give it a try, it wouldn't work for the visiting F/A. We then concluded that it must be tuned for male voices only. Other fun tricks were to explain that the overhead map light was really a telescope and oh, would you like to take a look? This meant having the gullible F/A lean way over to have a glimpse. Great fun. The -200 was a fun airplane to fly in a fun era but her day came to an end. What ultimately killed off the -200 was economics. The new -300s launched in the early '80s were much more fuel efficient and much more capable than their older siblings. It became rare that we had to accomplish a bleeds off takeoff and the aircraft burned significantly less fuel. The last of the -300s are themselves being replaced by the "next generation" or NG series 737s, introduced in the late '90s, which themselves will eventually be replaced by the Max series aircraft now undergoing flight testing in Seattle. The airplanes I fly today all have large flat screen digital displays, integrated flight management systems and all the geegaws you expect to find on the most modern airliners. What became of all those old airplanes? Well some of them went to Eastern Europe or Africa to fly around before being retired. I remember one of our airplanes which had flown for us for decades was wrecked by some fly-by-night outfit perhaps months after leaving our fleet. Most of those airplanes, though, were probably made into soda cans. An ignominious end to a glorious flying machine, but the memories of that time still remain. And while the gig isn't perhaps as good as it once was, it's still pretty good. And as I always say, it still beats working for a living. Update: Do you have any good old-school war stories about the -200 (or three holer, or DC-9)? I'd love to hear them. Leave a comment here or on the FB page!